Awnings are a type of tent that you attach to the side of your caravan. Whether you need somewhere to store your muddy bikes, a larger dining area or a cool place to sleep during those occasional hot summer nights, awnings are a great way to enhance your caravan. As awnings are available in all shapes and sizes you are sure to find one that will suit your needs and your make of caravan. Awnings are made out of a variety of tough materials that can withstand the elements and provide stability. Most tend to be made from either polyester or acrylic. 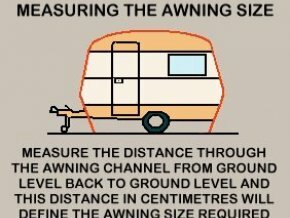 The awning measurement for your caravan should be detailed in the handbook (although if it is not, it’s a fairly simple task to measure your caravan for an awning). To measure for an awning make sure that your caravan is on even ground as this will help you to take accurate measurements. First, thread a piece of string through your caravan’s awning channel making sure that it touches the ground at both ends. If you are doing this on your own and there is a bit of slack in the string, put a weight on one end (a lump of putty works well). Mark on the string where it meets the ground at both ends then remove it from the channel and measure from point to point in centimetres. This is size of the awning you need. Next, you’ll need to choose which depth of awning best suits you. Our members recommend visiting a showroom and walking around and inside some awnings to give you an idea of which one is right for you. Awning carpets or groundsheets also add to your accommodation and provide useful protection for you and your pitch. However, awning carpets and groundsheets do not allow the grass underneath to breathe, so it’s a good practice to lift them when they are not in use.